commander of The Guppy was first seen in 1963, and has been appearing in new adventures ever since. And never mind the fact that Cap is a star of cereal commercials, where lots of characters are in production for a long time, and not the entertainment end of the TV industry. Even there, he's one of the biggest successes, still his familiar self after all these years. Sugar Bear, Tony the Tiger, Snap, Crackle & Pop may go back farther, but they've all undergone radical design changes over the years. Only The Quaker Oats Man, granddaddy of cereal toons, has been running in his present form longer than Cap'n Crunch — and he isn't nearly as much fun. Cap'n Crunch (who also works for Quaker Oats) was a result of market research indicating the one quality kids (who by the early 1960s were behind most cereal-buying decisions) most wanted in a cereal was crunch — i.e., resistance to sogginess when wet. So their chemists devised a reasonably non-toxic substance that would more-or-less live up to the slogan "Stays crunchy even in milk! ", and still provide about as much nourishment as most other cereals. Then they pre-sweetened it, i.e., coated it with healthy, energy-packed sugar, and dreamed up the name. All that was lacking was the advertising campaign. Possibly jealous of the success General Mills was having with TV commercials using the Jay Ward characters (to say nothing of Kellogg's with Hanna-Barbera), the Quaker people called on Jay Ward's animation studio during June, 1962, to discuss the matter. Ward was considerably less than enthusiastic about commercial work, because he didn't like the restrictions clients insisted on, but what the heck, he was out of town. They met with one of the studio's writers, Allan Burns, and worked out the outlines of the project. Later, Ward, who hit it off on a personal level with Quaker CEO Ken Mason, okayed it — but only as long as it remained fun. Captain Horatio Magellan Crunch was cast as an apparently-doddering old man (very old, but not really very doddering), not excessively bright, but with plenty of pep (no doubt from eating his own cereal). Daws Butler, his voice, used a style he'd originated for Fractured Fairy Tales. Cap's crew consisted of four children (Alfie, Brunhilde, Carlyle and Dave) and a dog (Seadog). He also had an arch-enemy, Jean LaFoot the Pirate (voiced by Bill Scott), who was constantly trying to steal the cereal. But LaFoot never succeeded, because Cap would find him by homing in on the sound of the pirate eating it. "You can't get away with the Crunch", Cap would sagely remark, "because the crunch always gives you away!" The ads, which began appearing in September, 1963, in a six-city trial, went over so well, grocers couldn't keep the cereal on the shelves. In fact, the company couldn't manufacture the stuff fast enough — they had to build a new plant before it was introduced nation-wide, in 1964. A few years later, a survey returned the surprising result that Cap'n Crunch was the most popular animated character on television. These and more flourished during the 1960s and early '70s. One by one, tho, they and their cereals faded from view. But Cap'n Crunch and his cast remained. 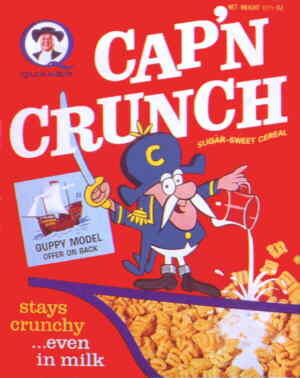 In fact, the Cap'n Crunch commercials became the studio's main activity in the 1970s and early '80s. Eventually, the bloom was off the rose. Everybody was older. Some had retired, and some died. New people were in place, and were ordering the sort of tedious revisions that had soured Ward on commercial work in the first place. It wasn't fun anymore, and fun, it will be recalled, was the condition under which the task had been undertaken. In 1984, Ward let the contract lapse, and retired. Today, the Cap'n Crunch commercials are animated in a very different style, with lots of modern, computer-generated effects. Daws Butler and Bill Scott are both dead, so the characters don't sound quite right anymore. But Cap and his crew still look and act the same, and Jean LaFoot is still doing his nefarious deeds — and the crunch keeps on giving him away. Text ©2002-03 Donald D. Markstein. Art © Quaker Oats.